Description: A rare compendium comprising Nos. 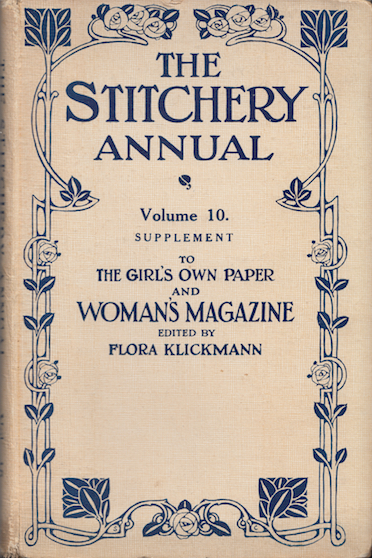 37-40 of Stitchery – the quarterly supplement to The Girls' Own Paper and Woman's Magazine. Illustrated throughout with a mix of line drawings, and excellent, high-quality b&w photographs of young Edwardian ladies modelling the finished articles. Also features many period advertisements (in b&w) for assorted textile manufacturers. Decorated cloth boards with dark blue text to front. Spine and corners bumped and slightly worn. Previous owner's name and date of acquisition (October 1922) in black ink on ffep. Pages are printed on high-quality glossy paper, and – apart from some light creasing – are in truly incredible condition for their age: completely free from foxing and tanning. Also includes a newspaper clipping from the 9th January 1923 containing instructions for square stitching. Measures 21.5 cm × 14.5 cm (8.5″ × 5.8″). 8vo. 98 pp.